As I usually do when making my monthly menus, I asked J if he had any requests. This time around he requested Gumbo. Hmm…interesting request. And something I’ve never made (or eaten) before, so I set out searching for a recipe. It seemed that all the “traditional” gumbo recipes were a bit time-consuming and since this would be my first time to make it, I thought it might be better to start with a little less-complicated recipe. 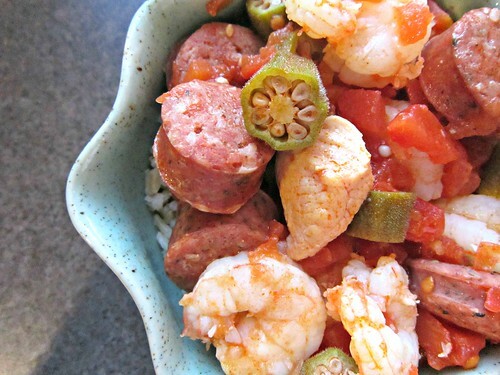 I ran a couple of recipe options by J and we decided on this one, which is a Jambalaya-style gumbo…most of the ingredients you’ll find in gumbo (spicy sausage, chicken, and shrimp…perfect protein trio for my meat-loving man), but with a less labor-intensive Jambalaya type of sauce. No roux that takes foreeevvvver to make. Some day I’ll try it, but it wasn’t happening for my first attempt. You may remember that I mentioned awhile back that J shot a deer and that we have a ton of smoked venison sausage in our freezer. Well, it just so happened that I already had this recipe on the menu when the sausage was ready and J went to pick it up, so I threw the spicy sausage I’d bought in the freezer and used the spicy venison sausage in it’s place. This was actually the first recipe I used the venison in! The picture doesn’t do it justice, but this gumbo has a thick, delicious sauce and the flavors are spicy and amazing. The only thing J said was that he wished it there had been more deer sausage…ha! It was really good over brown rice and it made plenty for dinner and a few servings of leftovers for both of us. Place a large pot or Dutch oven over medium-high heat, and add the olive oil. Once the oil is hot, add the sliced sausage in, and allow it to caramelize and brown for a few minutes. Remove the sausage from the pot, and set it aside. Add the chicken pieces to the pot along with a sprinkle or two of salt and pepper and allow them to brown in the oil/sausage drippings for about 2-3 minutes. Remove the chicken pieces from the pot, and set aside with the sausage. Next, add the garlic to the pot and stir for about 30 seconds until fragrant. Add in the bay leaves, the Creole seasoning, the cayenne pepper, ½ teaspoon of salt and ½ teaspoon of black pepper, and stir to combine. Stir in the tomato paste, and cook for about 1 minute, then add in the sliced okra, the diced tomatoes with juice, the hot chicken stock, and the browned sausage and chicken. Stir to combine. Simmer gently on medium-low heat, uncovered, for 20 minutes. Add in the shrimp and simmer for just about 2 minutes more, so you don’t overcook the shrimp. Finally, stir in the chopped parsley and cilantro. Serve over the rice, with a dash or two of hot pepper sauce for some added heat!